As I have previously been researching Vogue, I have decided to develop a new brand and identity for a fashion line. The concept set has a target audience who buy luxury products, and enjoy high, quality and the luxury lifestyle. I have researched into studios which create branding and identity for fashion lines, and have gathered a collection of products and identities below which I feel I can be inspired from and adapt process or technique. Construct Studio: "We describe ourselves as a design boutique. This reflects our small but beautiful size, our clientele and our dedication to the authentic, the specialist and the sophisticated. We are a design practice based in London our services include; branding, graphic design, copywriting, strategy and art direction." 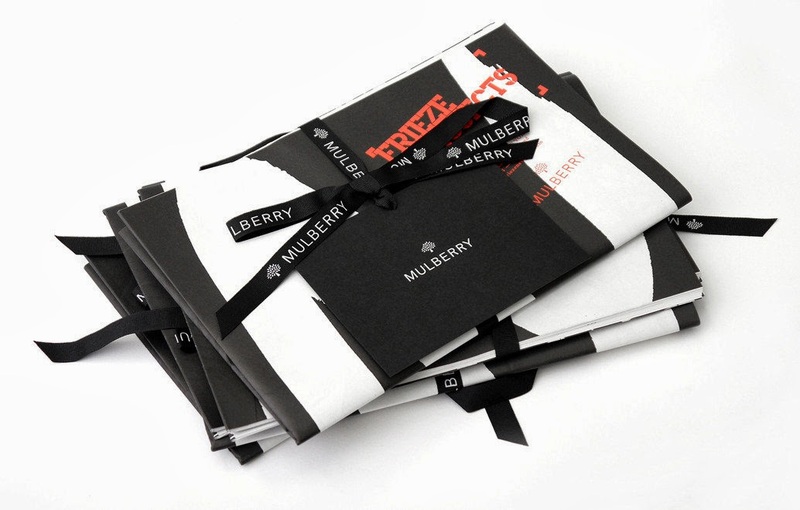 An ongoing programme of work, which started in 2006, has included the refinement of the Mulberry logotype and famous tree marque, corporate communications, environmentally responsible packaging, as well as branding and communications guidelines for Mulberry Seasons Christmas 2009, AW2010, SS2011, AW2011, SS2012 and AW2012. 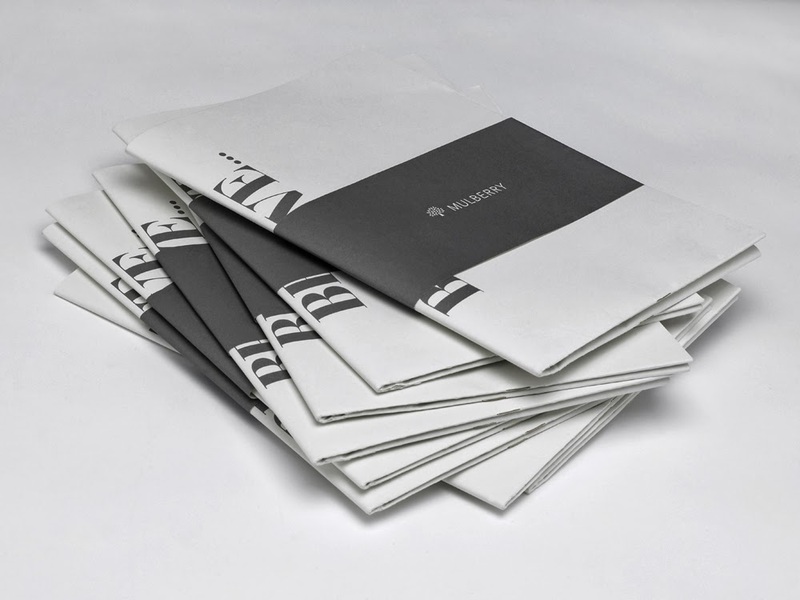 Look Book style Newspapers with a silver foiled logo on a matte black belly band. 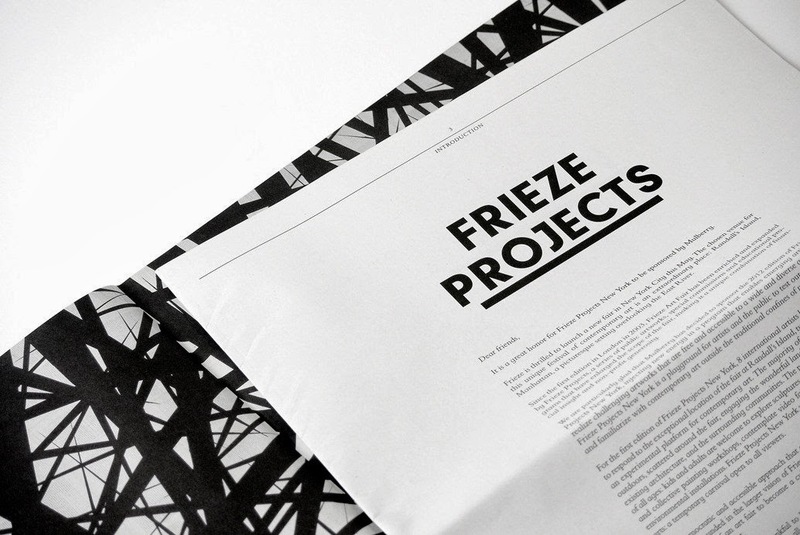 Elegant, smart, sophisticated, monochrome and functional in regards of format. 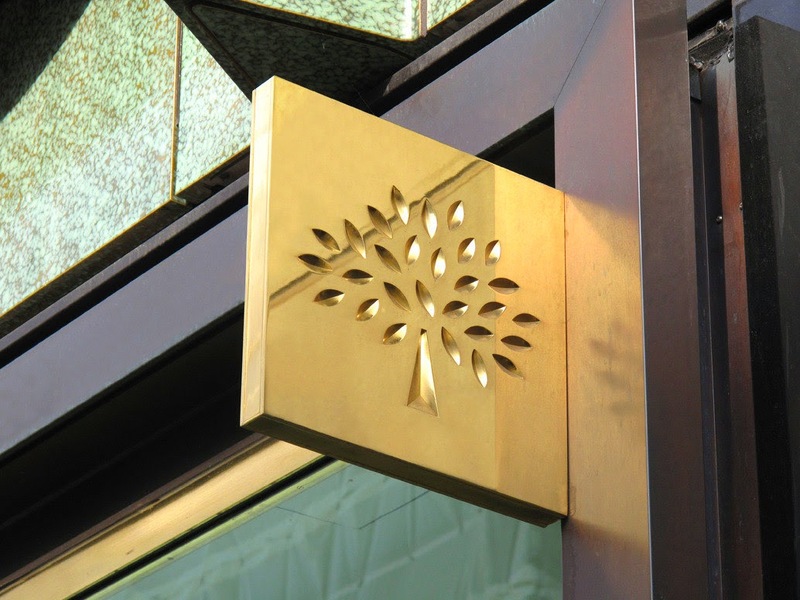 The Mulberry 'tree' logo shown on signage - exterior. Adds a sense of worth, an established brand and high quality goods and services. Monochrome logo which is adapted through colour and finishing processes seasonally and for different collections. It also depends on the photography and colour scheme chosen. Simple, smart, elegant, sophisticated and distinct. 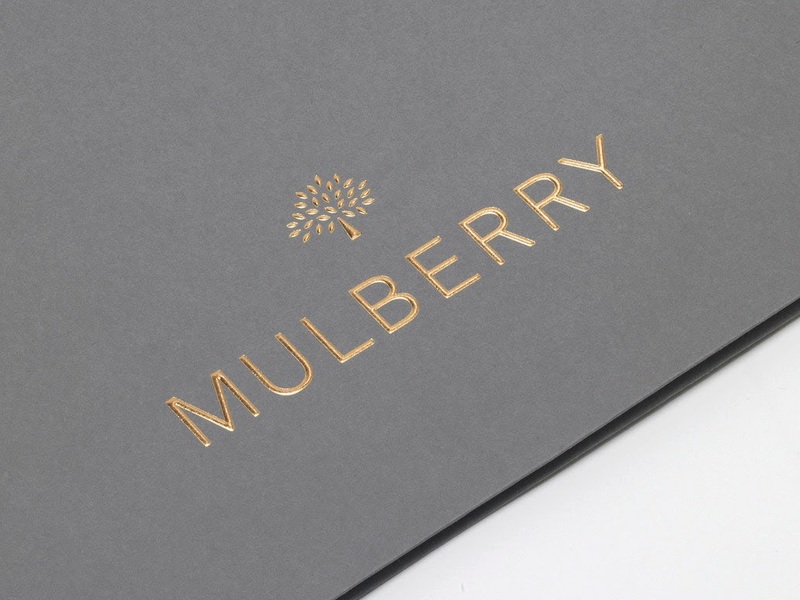 Embossed and Foil blocked logo - adds a sense of high quality and worth to the brand. 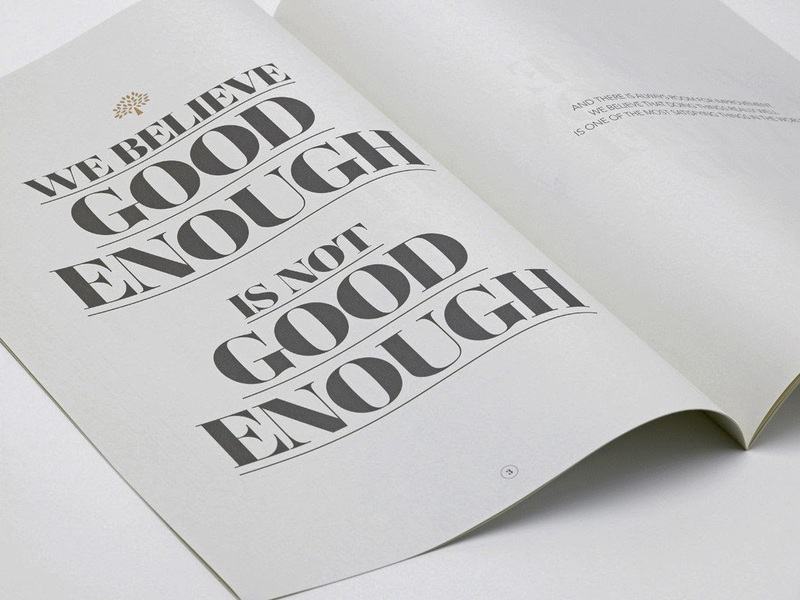 Look Book - heavy typographic elements keeps the brand fresh, young and elegant. Again the use of monochrome and gold. 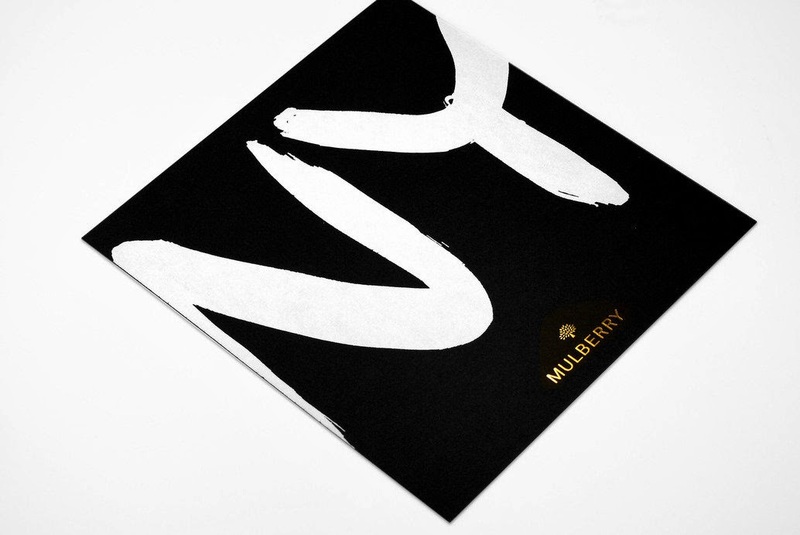 Stationary features the Mulberry logo embossed and foil blocked in gold, on white and dark grey matte stock. Smart, clean, elegant, expensive, and luxurious. 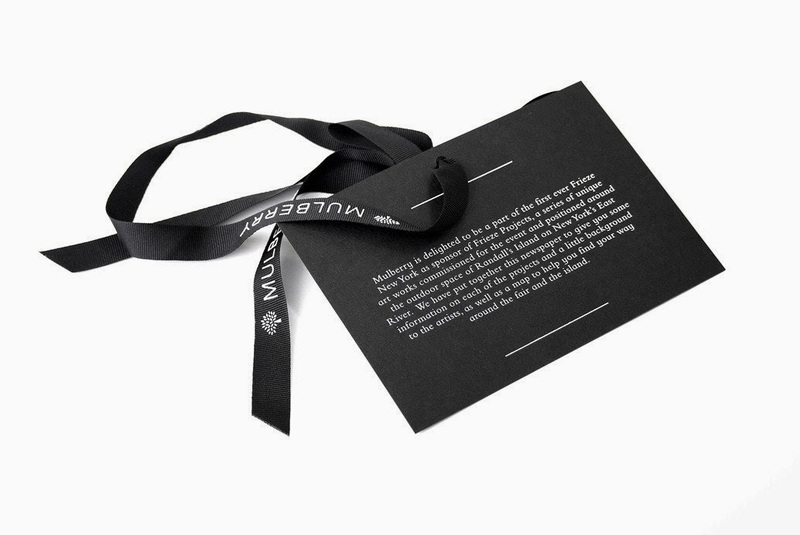 Logo adapted to tissue paper for additional product packaging. Spot varnish finish, with ribbon closure as seen below. 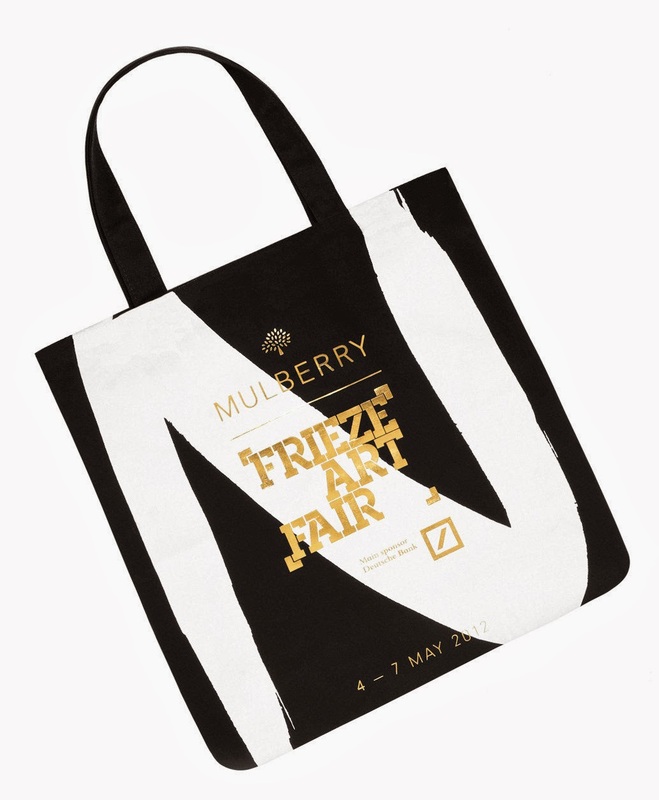 To celebrate the first ever Frieze New York, Mulberry sponsored Frieze Projects - a new initiative that saw eight artists commissioned to create artwork or installations around the outdoor space of the fair’s location on Randall’s Island. Construct were asked to design complimentary tote bags, newspapers and a map to help visitors navigate the installations on Randall’s Island. 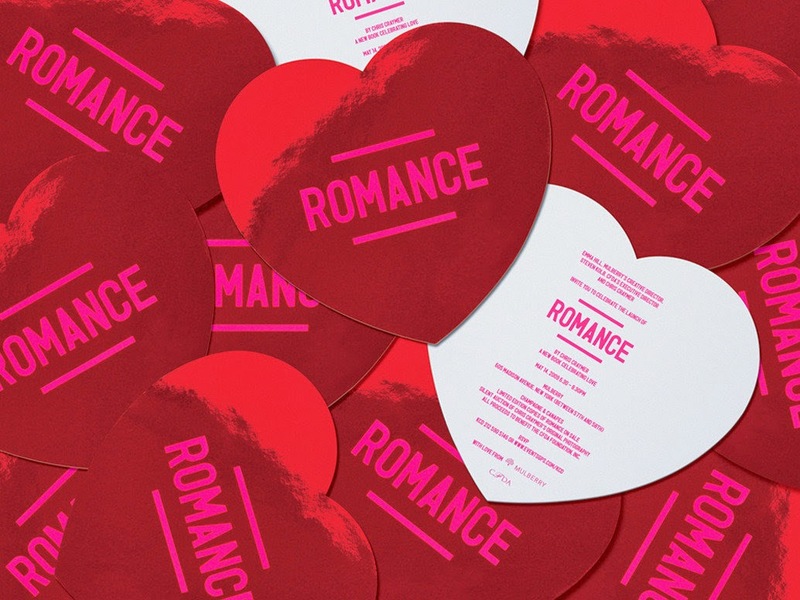 In addition, the studio created invitations for a celebratory dinner for Frieze and the NY art scene, with a special performance by Lana Del Rey. Again the monochrome and gold colour scheme has been applied to tote bags enforcing the brand again through the campaign at hand. Look Books and Tags as shown below. The look books fold out into larger posters. 'Hand bag size' folded up. 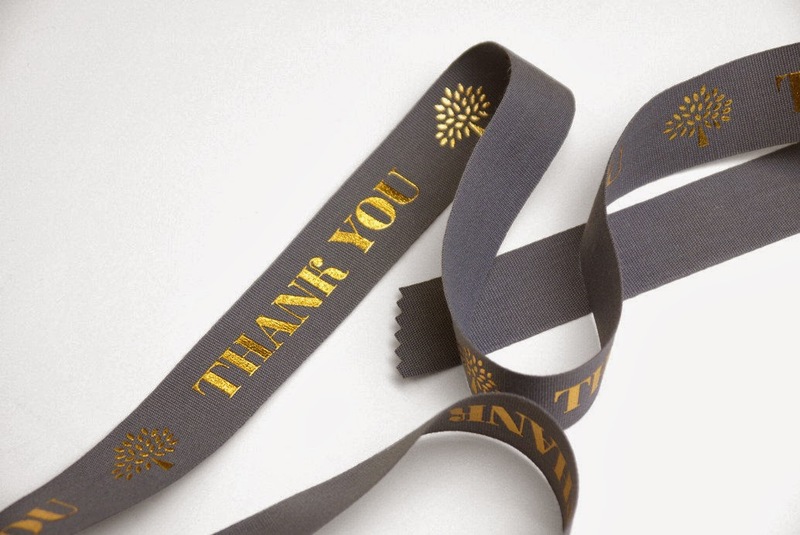 Tag and ribbon give an extra polished and elegant, smart, finish to the branding and identity. The Berkeley hotel's designer afternoon tea, Prêt-à-Portea, is inspired by the themes and colours of the fashion world. 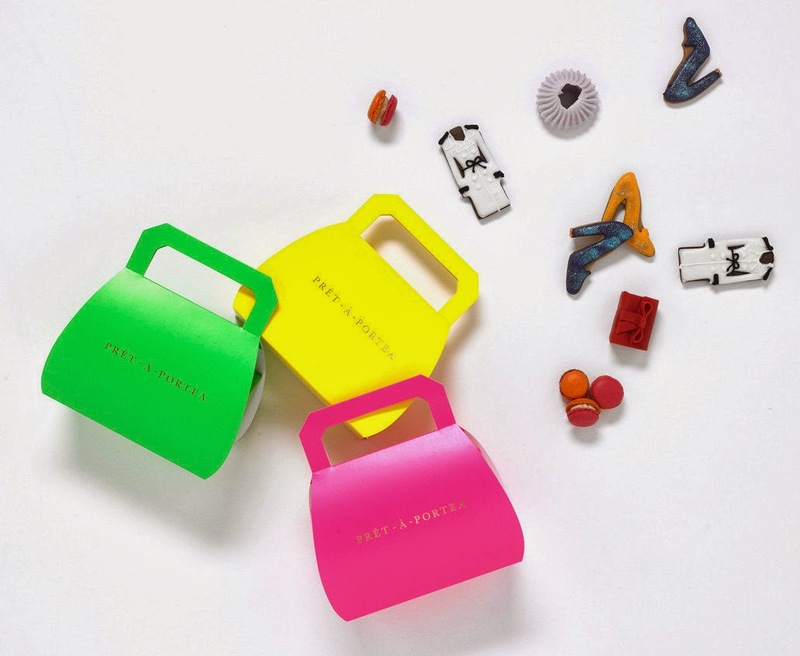 The menu is transformed every six months to follow the changing seasons in fashion. Prêt-à-Portea adds a creative twist to the classic elements of the traditional English afternoon tea, with cakes and pastries resembling the latest catwalk designs for the style-conscious. Construct took charge of revamping the branding for this iconic product by incorporating a fluro colour palette to make it distinctly feminine. 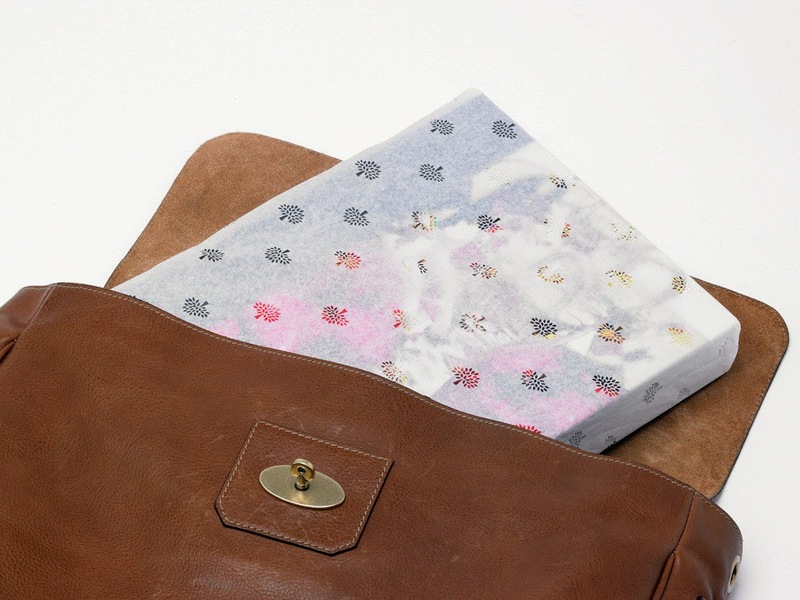 In addition we developed an illustration palette to be used as UV varnish and blind embossed on the menu covers. 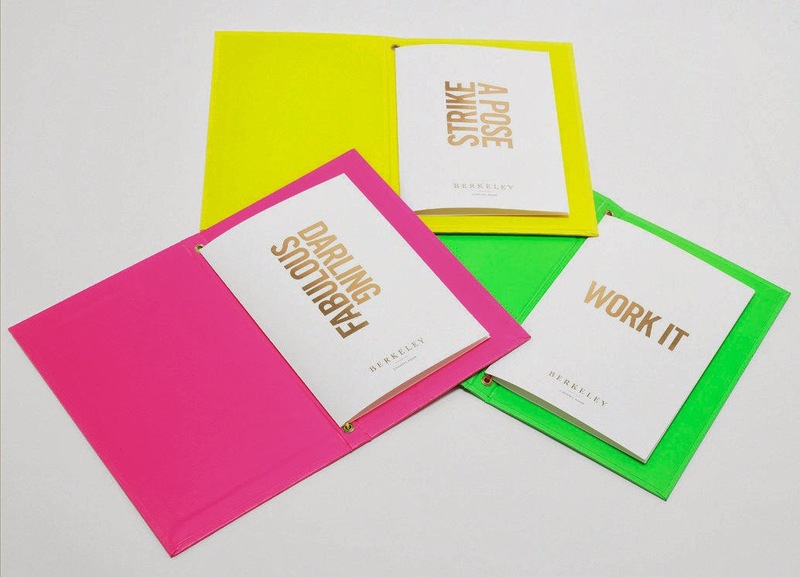 Gold foiling and spot varnish is used throughout so gain a luxurious and ultra feminine tone of voice, especially against the fluro colour scheme. Fluro is very on trend at the minute and is reflected in a high-end manner through this branding and identity opposed to being reflected as a tacky and unusable colour scheme. 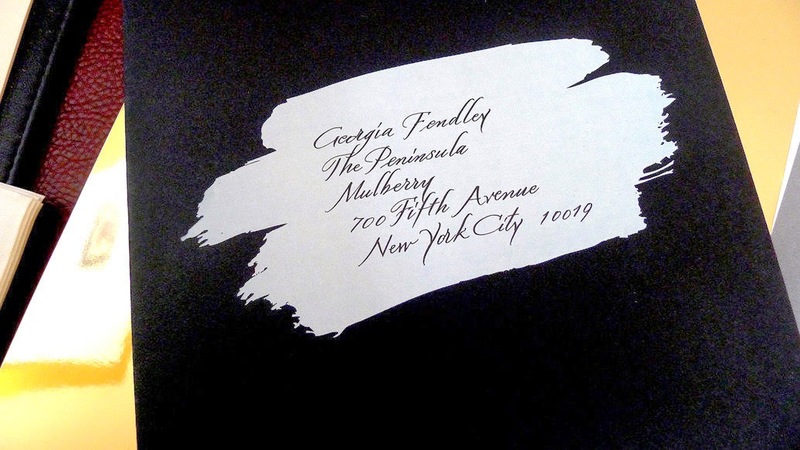 Classic, serif, simple logo for a luxury, high-end brand. 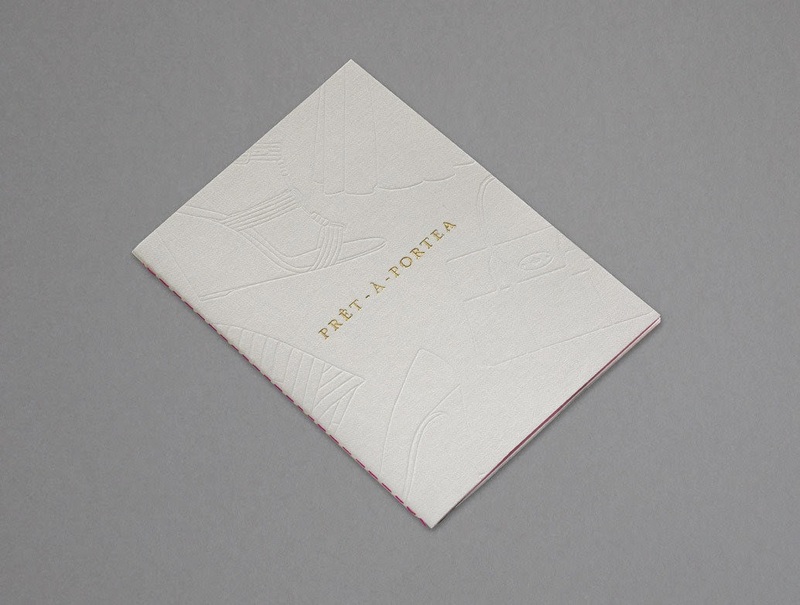 This can be seen foil blocked below along with a debossed texture to the stock chosen for the cover. Adds additional luxury and tone. 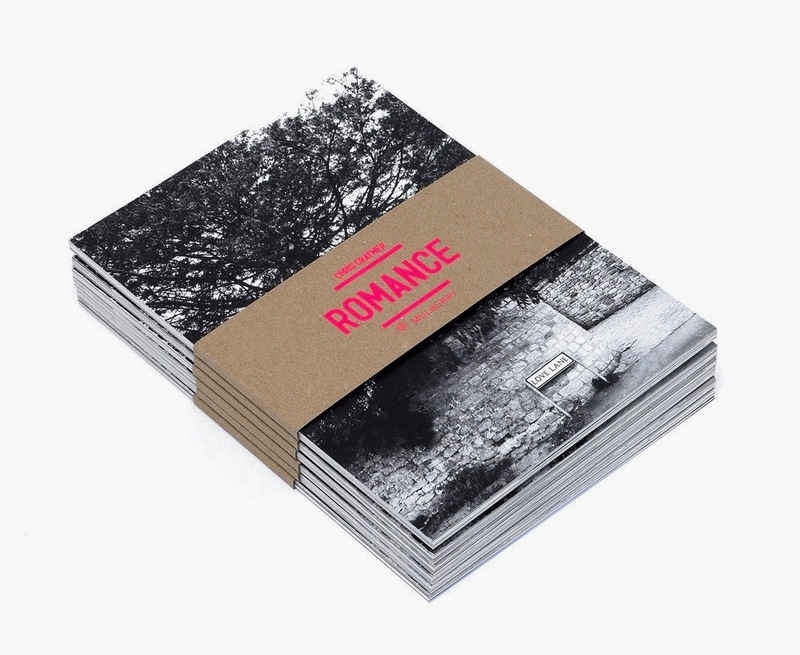 Construct has collaborated on a number of publications with Mulberry, in particular 'Romance' with Chris Craymer and 'Glastonbury - Another Stage' with Venetia Dearden. 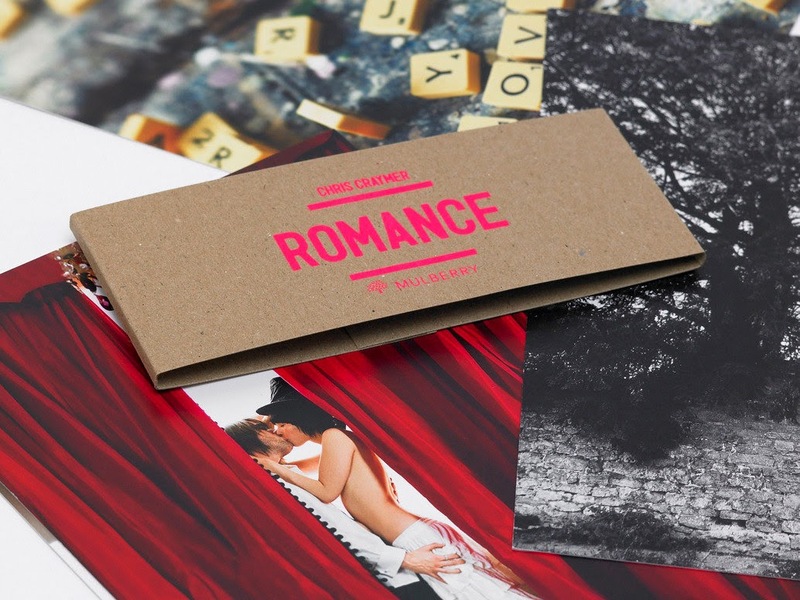 'Romance' is the culmination of an eight-year personal project by the New York-based British fashion photographer Chris Craymer. The couples featured in the book are sometimes models, sometimes not, but they are all real couples in varying stages of what Chris has described as ʻpre-mortgage love'. 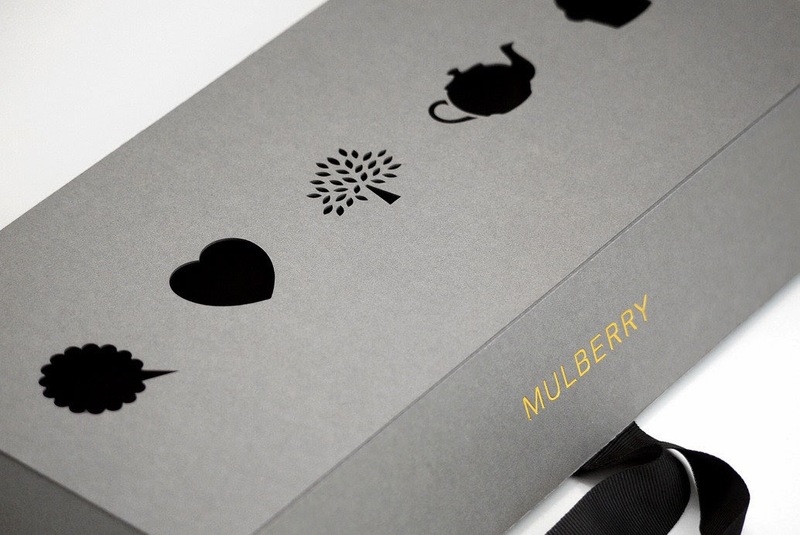 In collaboration with Mulberry, Construct was responsible for the book design and also marketing collateral and exhibitions, and for creating window display concepts. 'Glastonbury' documents some of the thousands of individuals who travel from all around the world to make up the vast and eclectic gathering that is Glastonbury. 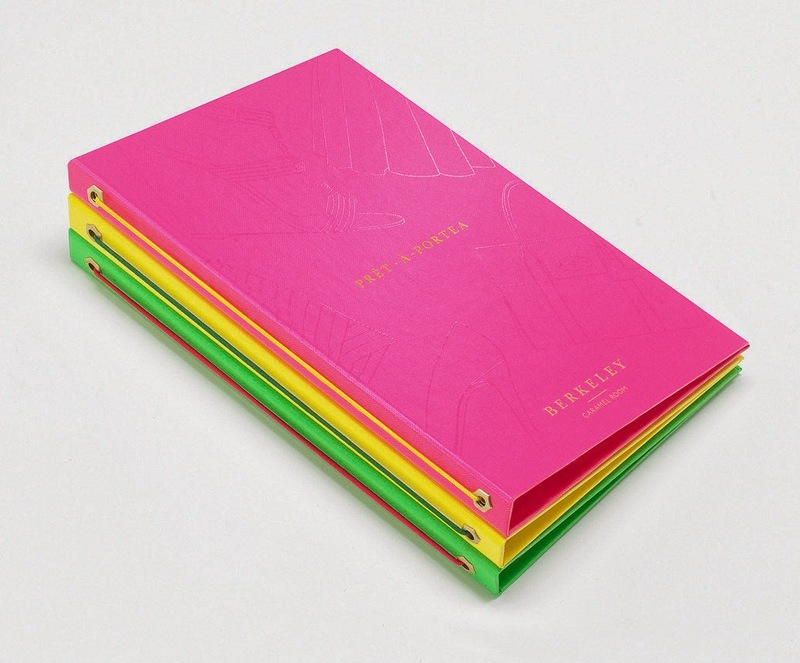 The pictures were shot at the festival over six years by the renowned photographer and regular Mulberry collaborator Venetia Dearden, and the book was designed by Construct. Use of screen printing on the belly bands and cards to show a true fluro pink colour contrasting with the neutral stock and colour background. Smart, fun and youthful whilst still being high-end and luxurious. Construct’s extensive and ongoing design programme for this luxurious English institution expresses the hotel’s Art Deco heritage, timeless glamour, and uniquely attentive form of traditional English service. The new identity created by Construct is an evolution of the hotel's established identity: the crest has been redrawn and a refined version of the typeface SangBleu (Blue Blood) has been introduced for the logotype to express the hotel’s heritage with elegance and restraint. 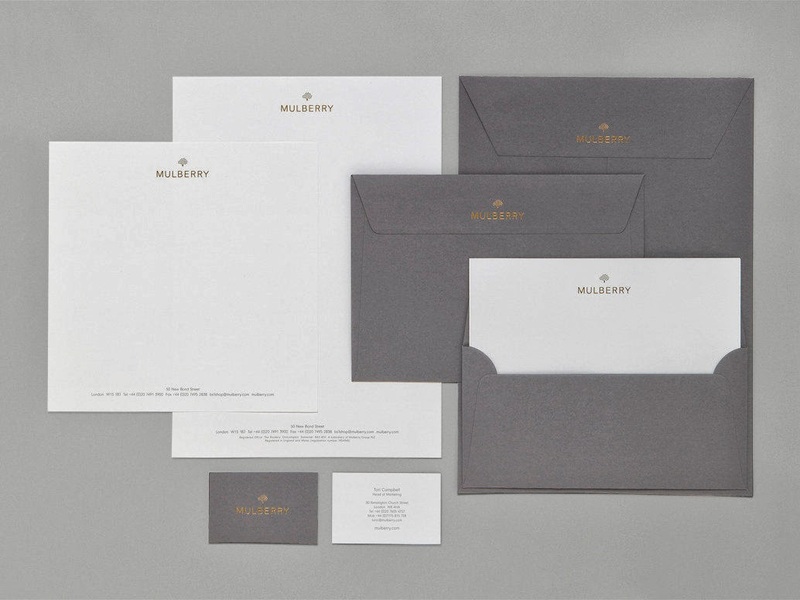 This refined identity is contrasted with a bold and opulent brand palette inspired by the hotel's architecture and features. 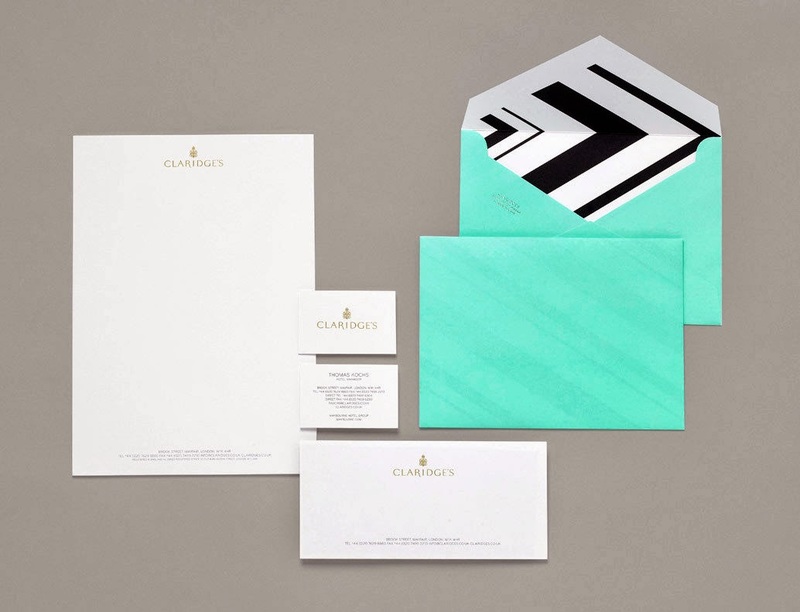 The Art Deco-influenced palette includes strong black and white chevrons and geometric patterns, contrasted with a fresh jade colour inspired by the original Art Deco bathrooms in the hotel. Construct have already designed more than 200 applications for the hotel, from carrier bags to rocking horses, and menus to umbrellas. One item, the silk kimono for suite guests, has already been identified as an heirloom piece by Liberty and the V&A. Gold or silver foiled logos have been seen throughout this post on many occasions and is seen again above. 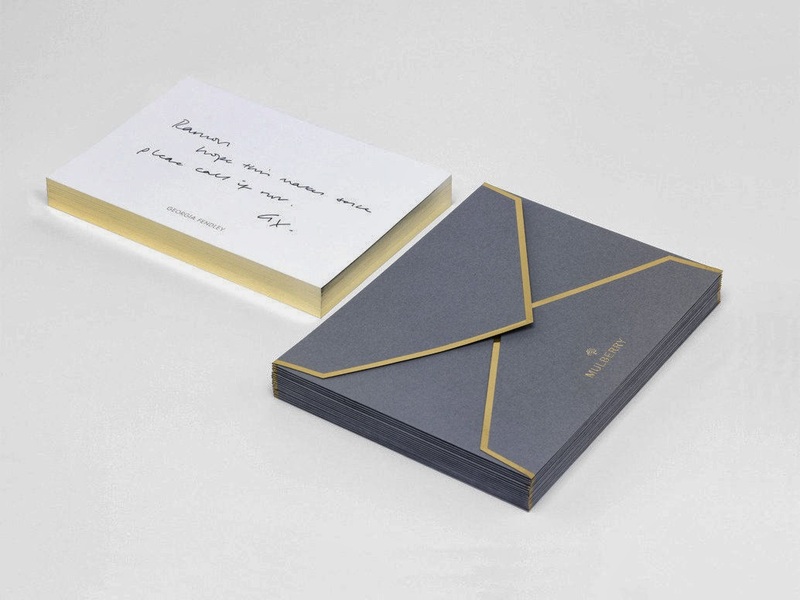 Gold being a royal colour adds a luxury tone of voice and elegance to any design it seems, when used with the right typeface and colour scheme. 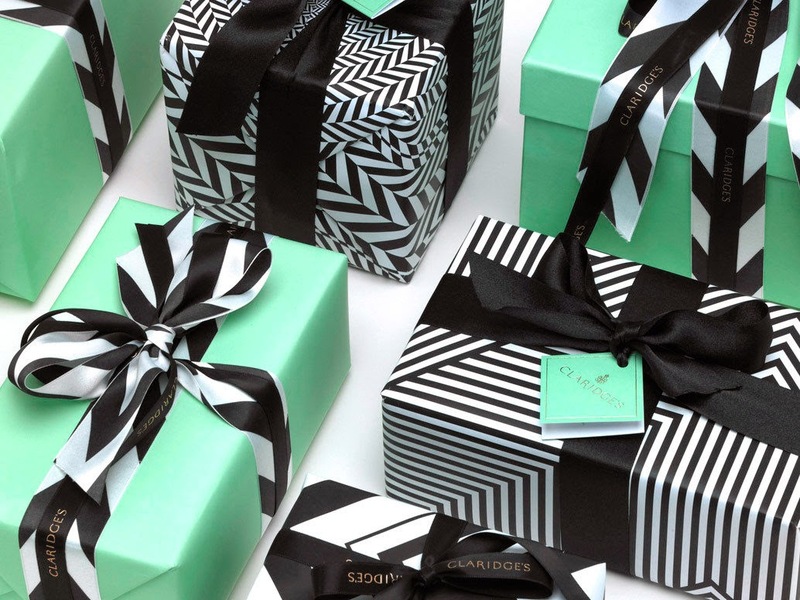 The packaging and stationary seen above is elegant, smart and visually eye catching with the contrasting green against the monochrome patterns. 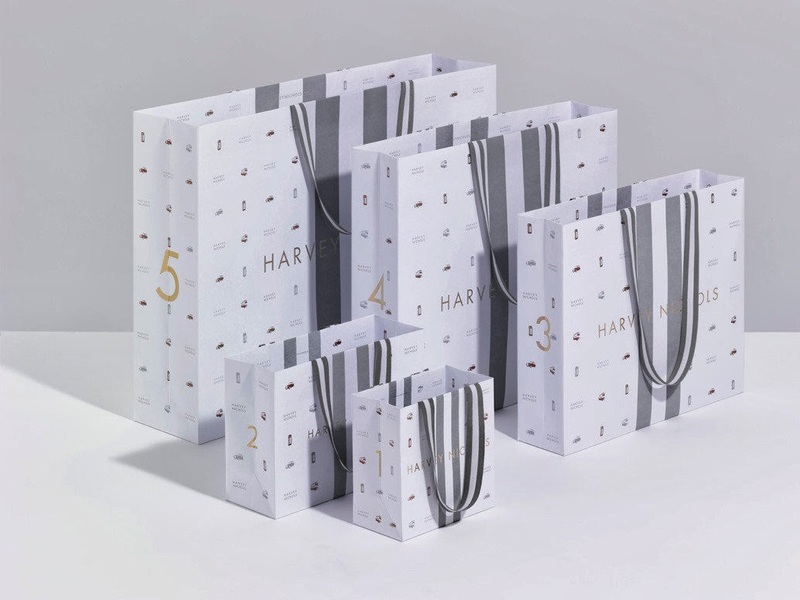 Construct created a limited-edition carrier bag design for Harvey Nichols to commemorate a year of key British celebrations. The new design uses London-inspired iconography in a year during which the Queen’s Diamond Jubilee and the 2012 Olympics have kept Britain firmly in the international spotlight. 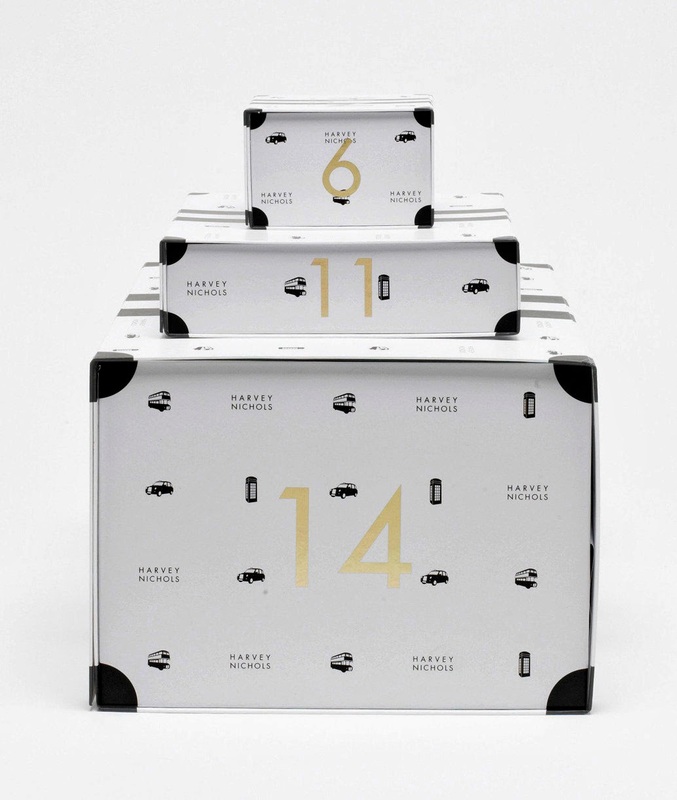 The design showcases four British icons in bronze, silver and gold – the famous Gilbert Scott telephone box, the double-decker bus, black cab and (of course) Harvey Nichols – representing what international visitors know and love about London. 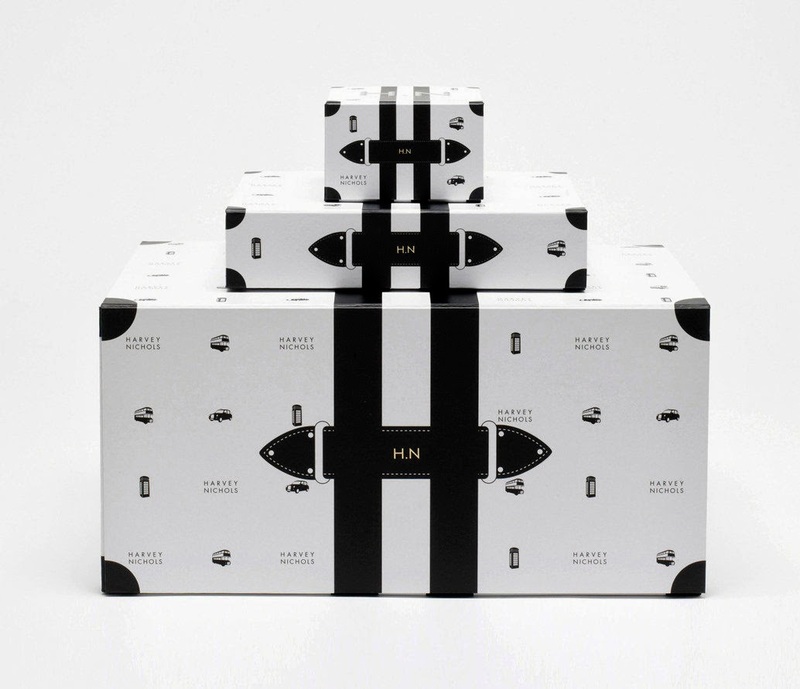 The limited edition carrier comes in five sizes, each identified by a corresponding gold number. 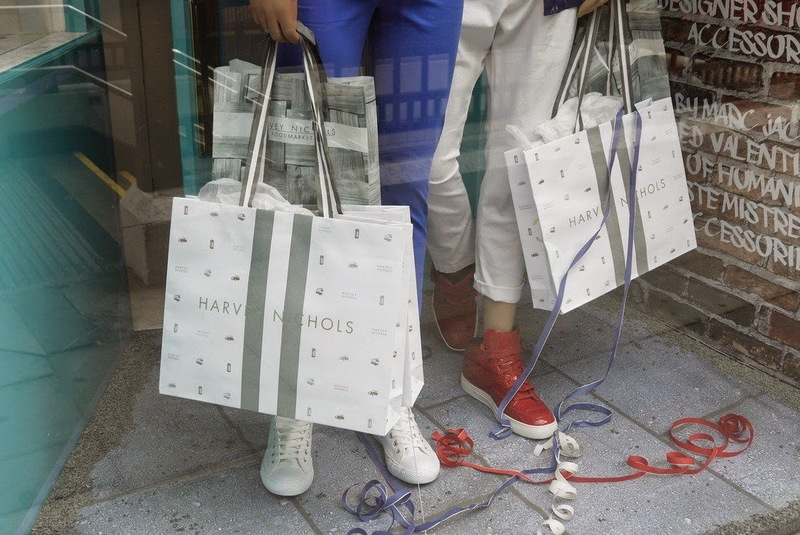 The Sloane Street windows celebrate the ‘delivery’ of the carrier bags with an installation featuring a specially-designed Harvey Nichols lorry, while the packaging is also incorporated in the Knightsbridge windows as part of the Queen’s Diamond Jubilee retrospective. 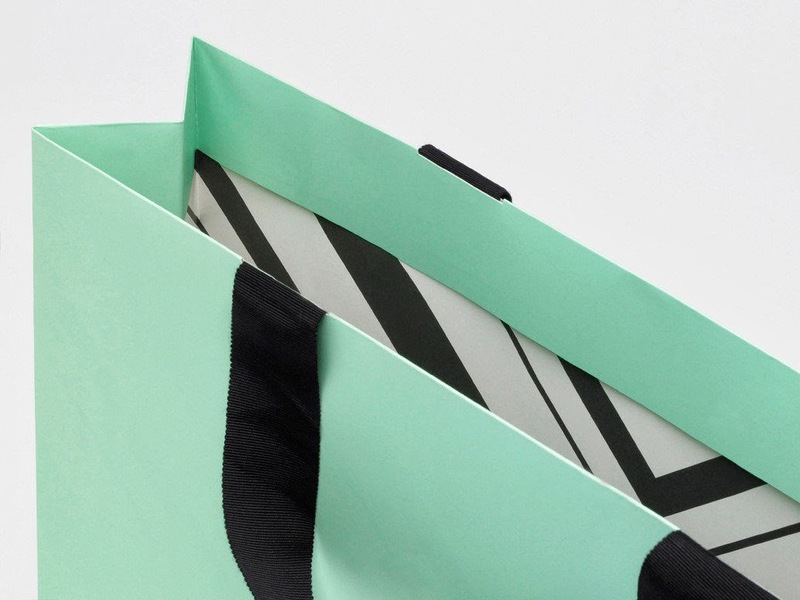 Harvey Nichols bags are required to be luxurious and reflective of the audience and the brand itself. 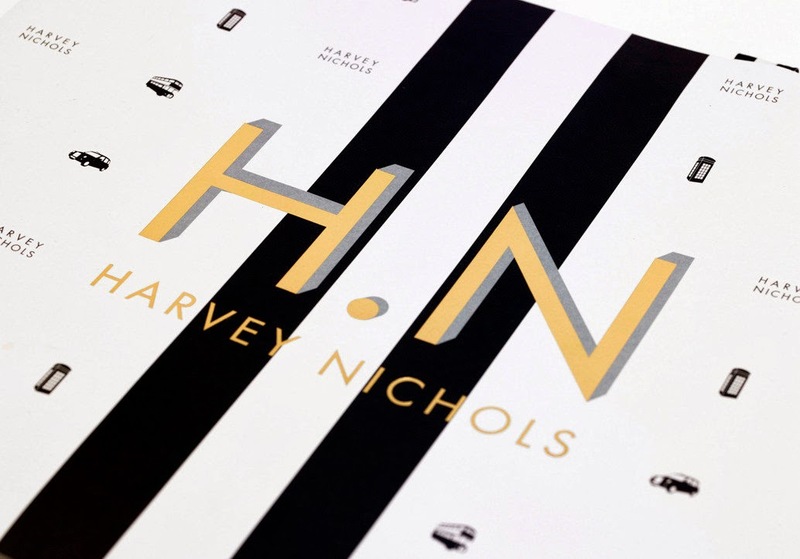 Harvey Nichols is known to be one of the most high-end department stores in the UK, and internationally along with Flannels and Selfridges. 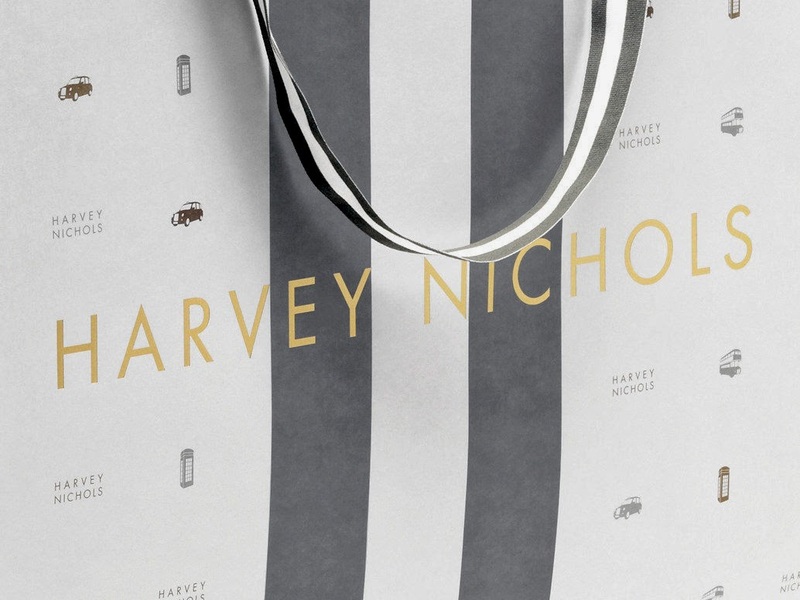 The gold foil finish on the logo adds a distinction to the brand and becomes a product itself opposed to just a shopping bag.